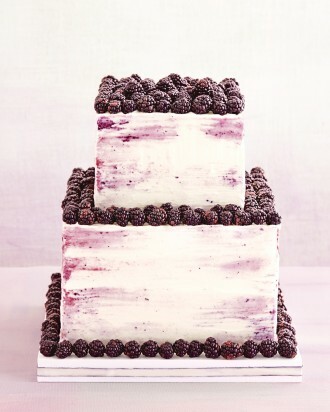 This two-tier blackberry wedding cake is absolutely stunning thanks to the blackberries surrounding each tier. The icing is also infused with crushed blackberries, giving it that gorgeous swirled look. You could have any kind of cake inside, but I think something not-too-sweet would be best. And of course, if blackberries aren’t your favorite, raspberries would be incredible on this cake and so would blueberries. Oh just imagine a lemon based cake and a light lemon icing infused with blueberries. Oh that would be divine! You can find this berry beautiful cake here.